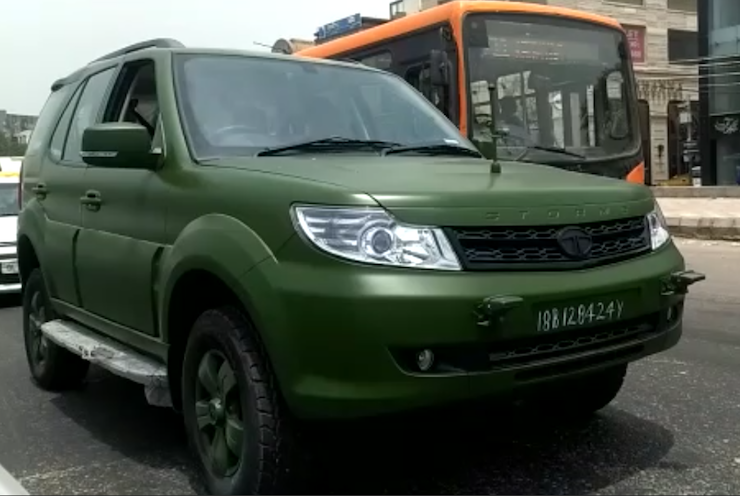 Tata Motors started dispatching the Army-spec Safari Storme a while back and these are now being used by the defence forces around the country. This special Storme meets the GS800 specifications and the only other contender from India was the Mahindra Scorpio. Here are some interesting facts about this SUV. The Army-spec Storme carries over the same 400 Varicor engine without any changes. It should be noted that during the initial handover of vehicles to the Army for trials, the vehicle had the older 320 Nm / 140 PS engine with a 5-speed manual gearbox but the ones being delivered have got an approval for the 400 Nm / 154 PS set-up that comes with a 6-speed manual gearbox. This Army-spec Safari also gets an all-new heavy duty real axle to take on added torture and abuse in areas where roads do not exist. Due to the new axle, the rear discs now get replaced by drum brakes. This Storme also rides stiffer and this is due to the fact that the suspension has been re-tuned to carry the extra load. The GS800 spec also requires the Storme to carry a load of 800 kgs while maintaining a ground clearance of 200mm due to which, as you can see, this Storme now rides higher. Exterior changes also include towing hooks, black out lamps at either ends, a flag hoisting mount and a jerry can mount on the rear left side. This mount can carry a can of up to 20 litres in capacity. The Army-spec Storme was tested for extreme weather conditions at various places. This includes North Sikkim for cold weather, Jamshedpur for hot weather and Hashimara for rain trials. The video you see above was captured in New Delhi and the Storme looks quite menacing in this new avatar – thanks to the new paint scheme and the raised height. This move is a welcome one considering that the Storme is a more comfortable and efficient alternative to the Maruti Gypsy. That said, it might not be able to replace the Gypsy completely given the latter’s ability to tackle tough driving environments with ease thanks to its light weight and a peppy petrol motor.